Amazon Price: $14.95 $14.95 (as of February 2, 2019 3:32 pm – Details). Product prices and availability are accurate as of the date/time indicated and are subject to change. Any price and availability information displayed on the Amazon site at the time of purchase will apply to the purchase of this product. 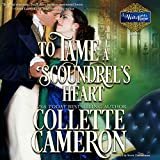 Katrina Needham had her whole life planned: Marry her beloved Major Richard Domont and live happily-ever-after…until he's seen with another woman. Distraught, and needing a distraction, she agrees to assist the rugged, and dangerously handsome privateer, The Saint of the Sea, find a wife.